Borrego Palm Canyon, Anza-Borrego Desert State Park, California. How is that for a creative title! Desert Wildflower, Anza-Borrego Desert State Park, California. Last night I finally had clouds to the north. You see, the desert gold all faces towards the south, so the fields look much thicker and richer when viewed looking towards the north. Sunset, Anza-Borrego Desert State Park, California. Recent sunset in Anza-Borrego Desert State Park. Sunday through Monday we received almost another half a inch of rain – made for some challenging conditions for my workshop, but could benefit the wildflowers going forward. Another new one from Anza-Borrego Desert State Park, California. Anza-Borrego Desert State Park, California. 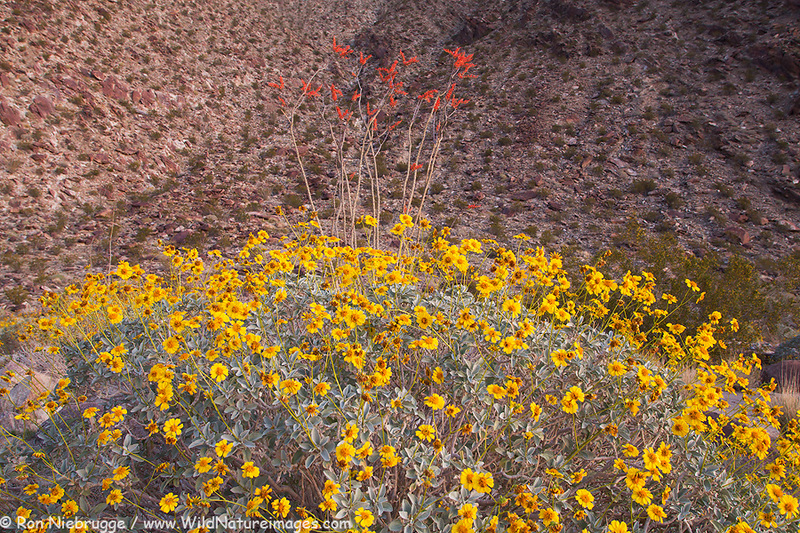 Another desert wildflower image from this week. 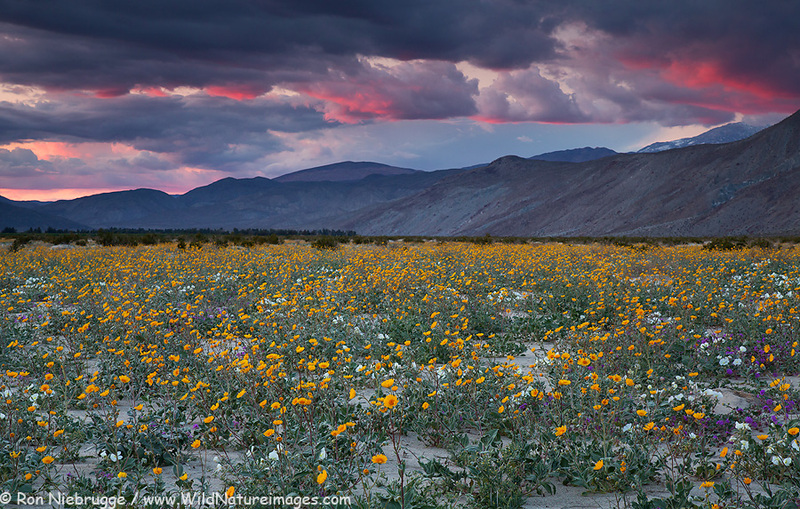 Desert wildflowers, Anza Borrego Desert State Park, California. This was last night – things are looking good! With much cooler temperatures in the weekend forecast, along with clouds and rain, the wildflowers could be looking good for the next week or two, with the cactus blooms lasting longer. Unfortunately, wind is also in the forecast, that won’t help. 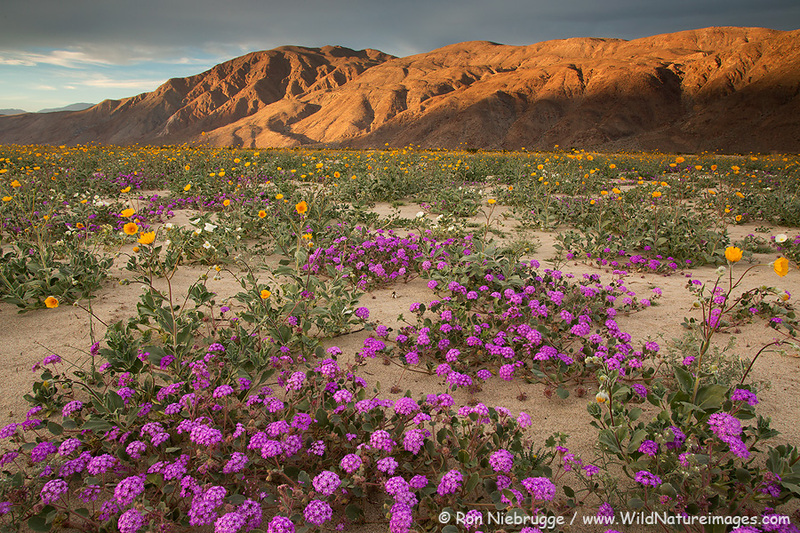 So where are the best wildflowers? This image is near the east end of Henderson Canyon Road – this area is looking very nice, with lots of desert gold still emerging, along with plenty of verbena, primrose and even desert lilies. Plus, I didn’t see any caterpillars. All along the mountains to the west of Borrego Springs seem to be the other best area. You will find a wide variety of wildflowers, including lots of blooming cactus, and this is really early for them! Some areas that are good include Henderson Canyon. Take Henderson Road to the West until it ends at the junction with Borrego Springs Road. Then you can take a dirt road for another half mile or so to the west. Lots of variety up there including blooming ocotillo, barrel and beaver-tail cactus. Good variety in Borrego Palm Canyon. 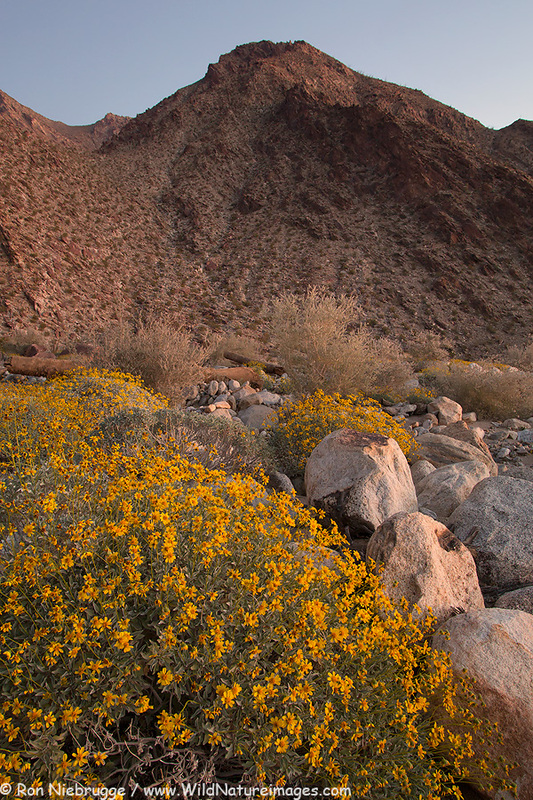 There is very little brittlebush in bloom on the hills, but plenty in the washes. Around the visitor center is nice – try the walk from the visitor center to the campground. I’m going to check out Hellhole and Glorietta Canyons today – Glorietta has been looking good, I’m sure it is only getting better. I have heard Hellhole and nearby Surprise are good, and that would make sense. I’m seeing very few caterpillars at the base of the mountains. The soil is fairly coarse and rocky here, and I think that might be why. The animal doing the damage is the White-Lined Sphinx Moth Caterpillar. A retired biology professor who lives in town tells me these caterpillars will dig a couple feet into the ground. I’m thinking these little guys need sand to burrow. So the caterpillars wiped out the beginning stretches of Coyote Canyon, but further up the road had some variety, particularly lots of blooming beaver-tail cactus. 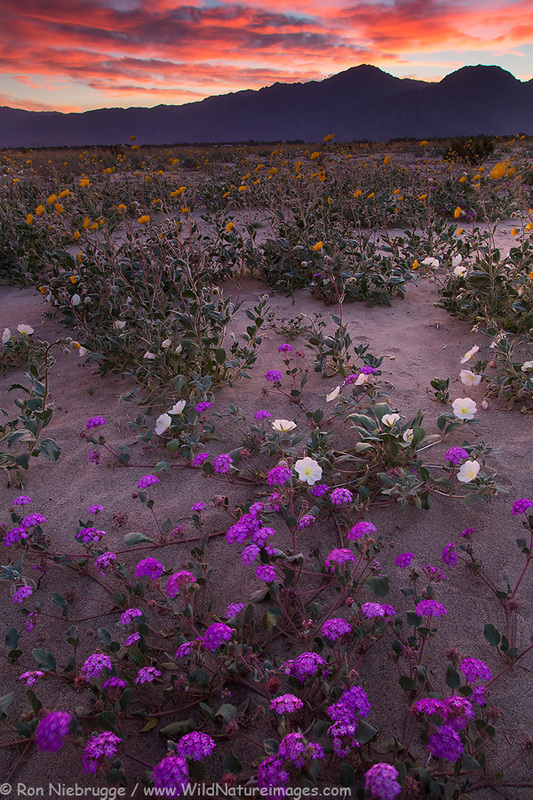 Finally, some of the fields along DiGiorgio Road near Henderson Canyon are pretty thick with sand-verbena. Unfortunately, the non verbena plants were crawling with caterpillars this morning, and I have a feeling these little guys might switch to verbena once the other plants are gone, so this area might not last long. 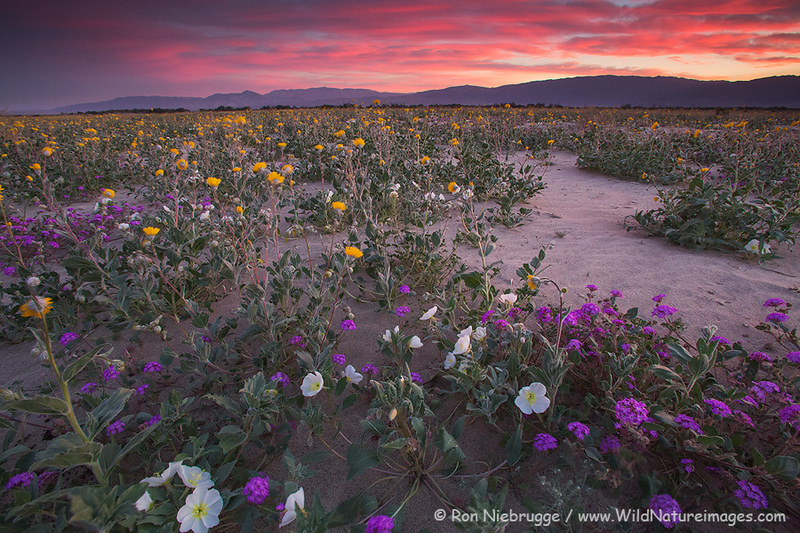 Desert Wildflowers from Monday night, Anza-Borrego Desert State Park, California. Update: Here are the most recent wildflower conditions along with hotspots. 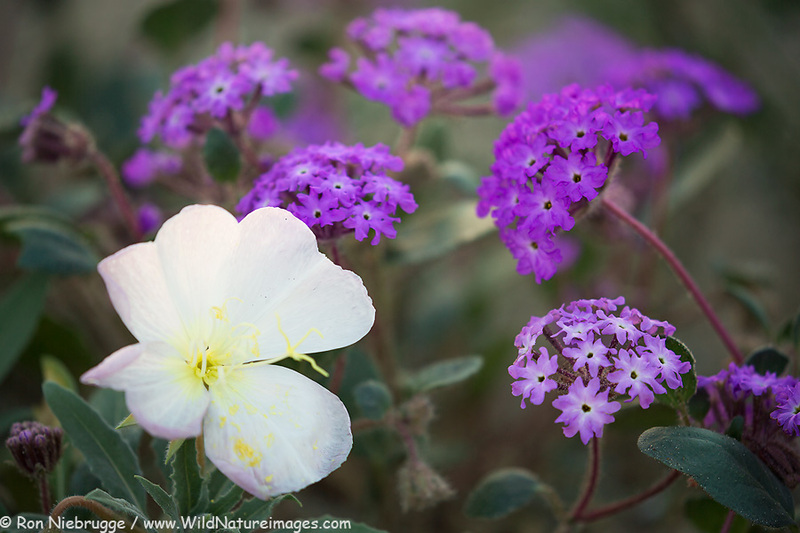 I was gone for a few days attending a couple different conferences – when I returned, I was surprised to see how many of the fields near our campground were coming alive with pink sand verbena I couldn’t wait to see what that meant for Coyote Canyon, which had been the best area around, especially since the temps had cooled, and a bit more rain fell Sunday night. Well I was shocked when I arrived at Coyote Canyon to find most the wildflowers were gone! I was driving along in disbelief when Janine noticed the dirt road ahead of us almost appeared to be moving. At closer look, we could see hundreds of caterpillars crawling around in every direction! It appears they have wiped out the wildflowers in this area. Fortunately, as we checked around some other areas that are just coming into bloom, areas like Borrego Palm Canyon, so far haven’t been effected by the caterpillars. The last time we were in Borrego Palm Canyon, it was looking nice, I’ll be back there soon for an update. There is another beneficiary to all the caterpillars, and that is the Swainson’s Hawk. As the “Hawk Guy” Hal Cohen has explained it, the large concentrations of hawks that show up here on migration this time of year would quickly wipe out the rodent / rabbit / squirrel population if they were to feed on such animals. On migration, caterpillars is there food of choice. So what might not be good for some of the wildflowers, is certainly good for the hawk. 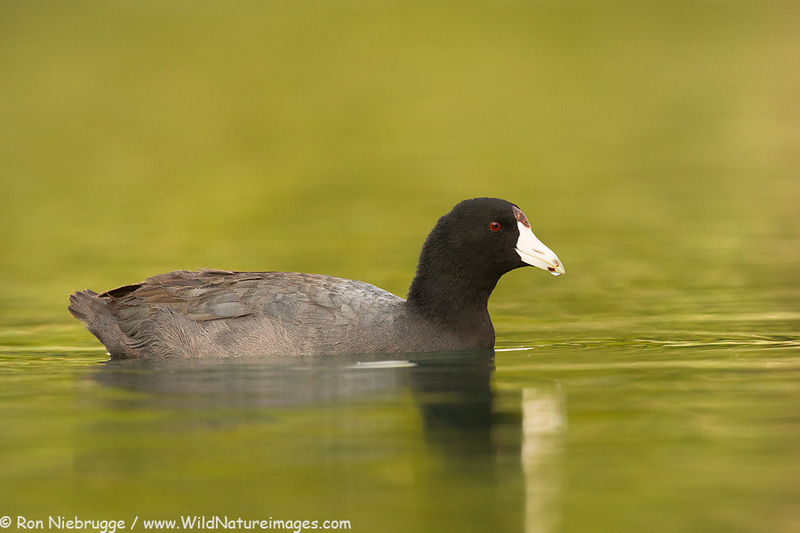 I seem to be photographing a lot of birds on this trip. That is about to change to desert wildflowers – a little more rain and finally some cooling should help!